When you call us, we’ll ask you a few questions about your project, and if you’re interested, set up an appointment to come to your home. When we meet, we’ll take you through our DreamBuilder Workbook and spend some time brainstorming with you. We request that all decision makers for the project be present for the initial meeting. We have found that this avoids the need for replication, allows all thoughts to be presented and is an easy way to have input from all parties. After our first meeting, we encourage you to gather examples of projects that you admire, and collect any other information you think would be helpful for us to understand what your dreams and desires are. NOW is the time to discover ideas that you would like to incorporate instead of finding that great idea after your project is completed. Look for stone types and finishes, plants, lighting, designs, and other great ideas you would like to include. If there’s a publication that you come across with a lot of ideas we’d encourage you to purchase it and review it with us. Some suggested landscape magazines to look at include Fine Gardening, Southern Living, Garden Design, House & Garden, Better Homes & Gardens, and Martha Stewart Living magazine. Houzz.com is a great website to gather ideas. Interested in receiving a Dream Builder Workbook? Just email us with your contact information and we will call you to set up an appointment and provide you with our Workbook. After you’ve completed gathering ideas, and desire to proceed with the project, the next step is to bring our Landscape Architect into the process to put all of the pieces of the puzzle together to create the perfect picture. She is expert at gathering all of your ideas and creating a design masterpiece which reflects a sense of originality while incorporating your desired project parameters, color choices, flow and functionality into a plan that works within your stated budget parameters. Creating a plan requires time, research, and originality. Often times a municipality may need to be contacted to inquire about restrictions, property lines, impervious areas, utilities, etc. As a result we do have fees associated with our initial architectural drawings as well as subsequent revisions. These fees are usually less than 2-3% of the total cost of your future project. Once you have agreed to proceed with having our landscape architect draw a plan, we will contact you in about 2-4 weeks to sit down and review the plan. At this stage you will begin getting a good idea of how your ideas and dreams are translating to an actual plan. You will also be able to give input and make changes if desired. At this juncture we’ll begin to put together some preliminary pricing for your project. To assist you in the budgeting of your project, the pricing is broken down into phases in case you choose not to do it all at once. We’ll also give you the pros and cons to doing your project in phases. At this stage we can make plant substitutions, material changes, etc and exchange that information via email or phone. Once we have reached all the necessary conclusions we’ll draft a final proposal and contract. Once the plan is completed, we’ll contact you to set up a time to present the final plan and costs. You will receive a detailed drawing incorporating the concepts and ideas that were previously discussed. The final result of our planning process is that you will have a design that you love, a solid construction budget number based on your initial budget figure, and the excitement and anticipation of a dream that is about to unfold. If your decision is to go forward with the project, 30 days prior to construction we’ll require a signed contract and 50% deposit with the possibility of progress draws throughout the build. Specific material selections will be finalized, and a time slot for your job will be reserved in our schedule. At this time we’ll introduce you to your project manager or site foreman and exchange contact information. Throughout your build you will have the same professional foreman and build crew which will make the relationship enjoyable and the build process efficient. If at any time you have a question about construction timeline, add-ons, or material feel free to ask the foreman. As we begin the build process, we will be bringing in a lot of heavy equipment and material onto your property and forming work-related staging areas that will create an impact. Your property will become an active construction zone, and there will be significant digging that will cause obvious alteration to your property at first! The extent of this phase is often underestimated by our clients and it can be somewhat shocking to see your yard completely dug up, with significant equipment impact. We can assure you that this is a normal part of the build process and once completed, will be a distant memory! 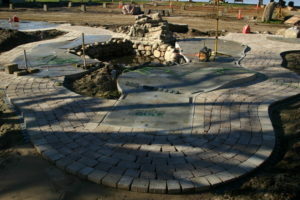 At the conclusion of the hardscape phase, the plantings, sod, lighting, speakers, and accessories will be installed. This is when your project really comes to life. You may feel free to begin selecting things at this point like decorative items, patio furniture, etc. A good resource to check is Bowman’s Stove Shop (www.BowmansStove.com). Once the project is completed, the foreman will do a final walk-through with you to seek your approval on the project. At the conclusion of the project our foreman will do a final walk-through with you on the project. At this time all necessary maintenance will be detailed and we will document any areas of concern that you may have and address them promptly. We’ll also discuss cleaning of the hardscape areas, as some patio areas require a curing time for joint sand that has to been cleaned in a specific way until it hardens over time. Now the real fun starts as you begin enjoying the fruits of all your planning! 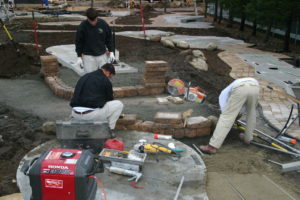 An on-staff Registered Landscape Architect will work with you to create your back yard masterpiece. As part of the design process, you will be meeting with Mary Dresser, a licensed professional Landscape Architect who has 28 years of design experience, is registered in the Commonwealth of Pennsylvania, and is a member of the American Society of Landscape Architects(ASLA). 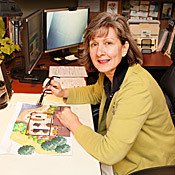 Mary and our creative design staff do not begin with preconceived ideas. They carefully listen to your input to understand your dreams, wishes and vision for your back yard, and have the ability to turn that input into a design that will “Wow” you. And we know how difficult it is to visualize designs, so we provide 3/D digital renderings if desired to give you a great idea what your final project will actually look like. We also have the expertise to develop and oversee residential stormwater management plans that are becoming more and more prevalent due to the restrictions of the Chesapeake Bay Watershed Criteria. We can seamlessly incorporate stormwater management solutions and gain all necessary approvals on all projects as required.